Come to the garden in spring. For the Sufi the garden had many meanings. It was a place of repose, a centrally located space which allowed one to enter any number of buildings, a place of beauty and meditation, a horizon where Allah had indicated the signs of life and a place where one could find the Gardener. Every tekke, or prayer lodge, of the dervishes (sufis) had a garden which was shielded from the outside by exterior walls. The garden was a heart to the many buildings which, like the projecting wings of a great bird, would make up the tekke. The semahane, (for the Mevlevis the place for turning and for other dervish orders the place for their ceremony of the remembrance of Allah), the majlis (the room for spiritual conversation), the women’s quarters, the kitchen, library, ablution fountain, the sheikh’s residence and the mosque could all be accessed from the garden. 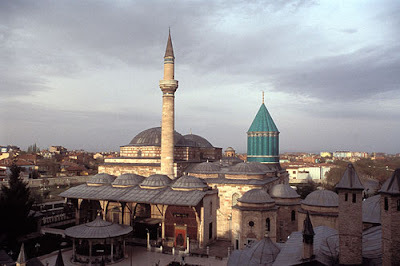 The garden court in the Konya Mevlevi tekke is spacious and in the interior space below below the conical tower, blue-green tiled and fluted with a pointed roof, rests the tomb of Mevlana Jalaluddin Rumi. On special occasions a sema would be performed in this garden under a sky dotted with birds and billowing clouds. I belong not to the earthly sphere. During these two or three days the dervish remains hidden, his concealment a protection, like the beautiful rose protected by the thorn. He is disguised by clothing or a mental attitude. Many sheikhs wrote verses about love. Like Rumi they were writing of metaphysical love, that which was beyond the physical, but not everyone understood this. Farid ud-Din Attar engaged in the trade of a chemist and had a shop in the bazaar. Others wrote on literary matters, were booksellers, poets, or pursued other callings. They concealed who they really were so as to avoid the “pestering” of worldly persons. Mevlana once said in such a discourse that God had a collyrium which, when applied to one’s eyes, opens the inner eyes, and one is able to see the mystery of existence and know the meaning of hidden things. One can be illuminated by the gaze of a sheikh. Rumi reminds us that when the inward eye is opened one sees that the flowers that grow from plants are living but a moment, while the flowers that grow from reason are ever fresh. The flowers that bloom from earth become faded while the flowers that bloom from the heart produce a joy. Know that all the delightful sciences known to us are only two or three bunches of flowers from that Garden. We are devoted to these two or three bunches of flowers because we have shut the Garden-door on ourselves. “Behold our words!” Rumi said, “They are the fragrance of those roses - we are the rosebush of certainty’s rosegarden.” The fragrance of the rose can lead one to the rose and even the Rose-seller. But sometimes Mevlana was anxious that time not be wasted, as he indicates in this poem. What business has a thirsty man with such words? Does the moth think about the flames? For Love’s spirit, thought is a disgrace. When the warrior hears the sound of the drum, at once he is worth ten thousand men. The sema has become a window towards Thy rosegarden; the ears and hearts of the lovers peer through the window. Several kilometers outside of Konya, sitting peacefully on a hilltop in Meram was the house of Husamuddin, Rumi’s khalifa and confidant. The wooden house was spacious with a generous garden and an orchard. Mevlana often came to this garden to meditate, give spiritual discourse and make a sema where he was joined by many of his disciples. Mevlana turned internally, his arms close to his body holding his robe; not like the turn we see today from the Whirling Dervishes which was created by Rumi’s son Sultan Veled. Mevlana’s nature was filled with kindness and so he allowed his disciples to gently embrace him as he turned and for a short time to turn with him. A similar movement to this can be seen in the Bedevi Topu as done by the Halveti dervishes. The sheikh breaks the turning zikr circle and holds the hands, crossed at the wrists, of one of his dervishes as they slowly turn together repeating the Name of Allah. 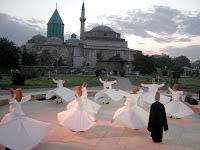 The other dervishes form concentric circles around them with the baraka of the inner reaching the outmost circle. A hadith of the Prophet Muhammad states: When you pass by the meadows of the Garden, graze! They asked: O Messenger of God, What are the meadows of the Garden? And he replied: The circles of remembrance. But let us go to the Gardener Himself. In Quranic spiritual landscape and discourse, Heaven - the Final Place of Bliss for the Returned Soul to their Source is often and repeatedly called as 'Garden' (Jannat). And the Garden of Divine Presence and Bliss is often mentioned as the final abode and reward for the devotees. Manifesting 'the Garden' is also symbolized for opening the Judgment. Fa-inna al jannata hiya alma'wa. Lo! the Garden - that is the abode. (To the righteous soul will be said:) "O soul, in (complete) rest and satisfaction! Enter thou, then, among My devotees!